Whereas WOODEN BABY's first tape, "Stuck in the Mind-Cage" shares only partial resemblances with OZRIC TENTACLES, which Merv Pepler just joined as a drummer, this second effort is this time more influenced by Ed Wynne's band. As before, "Forbidden pastures" still offers a wide variety and uncommon mix of 80's cold wave / gothic rock with 70's space prog, however now incorporating the typical "ambient trippy jungle" feel of GONG and their successors. Lasting 66 minutes, this cassette is also the duo's shortest in terms of duration. You're about to enter a strange world with "Gestation Of A Koala Bear", introducing the relaxing and mystical "The Sound Of One Hand", quite in the OZRICs' style. The track then accelerates to turn into a darker and frightening atmosphere with keyboards and guitar, while the ending part goes to back to calm. Not bad but first section is too long. Again, "Wasps Feet" has a nice OZRIC-ian Middle-Eastern-ish texture and a touch of LEGENDARY PINK DOTS, although different. "Pump-Face" reminds the pulsating 80's HAWKWIND song "Angels of Death", while "Exocism Of Anu" is mesmerizing spacey new-wave. Original but a bit lengthy. Side 1 concludes with the strange experimental interlude "Gullet-Ache", and the GONG-esque "The Eyes Of Tammuz" and its Arabic clarinet. Side 2 opens with the tape's best and most progressive track, the multidimensional "The Painted Smile". First beginning with an enigmatic electronic loop, this 7 minutes title features many changes as it turns to space rock with a pretty Hillagian guitar and then to an oppressive science-fiction tale. Excellent! Prepare to lose your landmarks with the pysched-out paranoid inner trip "Wading Gannets", and to be hypnotized by the "Table Of Existence". This trippy gothic composition in the vein of DEAD CAN DANCE's first opus is one of the best passages of the cassette. On the contrary, the ambient "Treading Air" is my least favorite with its a voice. Like an incantatory ritual, "Bombay Mix" assembles American Indian chants on Asian Indian sitar. Cool but not varied enough for 5 minutes. Fortunately, the ender "A Warm Sponge" is rather enjoyable. The first half consists in a cold wave song including a few special sound effects and variations, whereas the second half is more rocking 80's HAWKWIND. 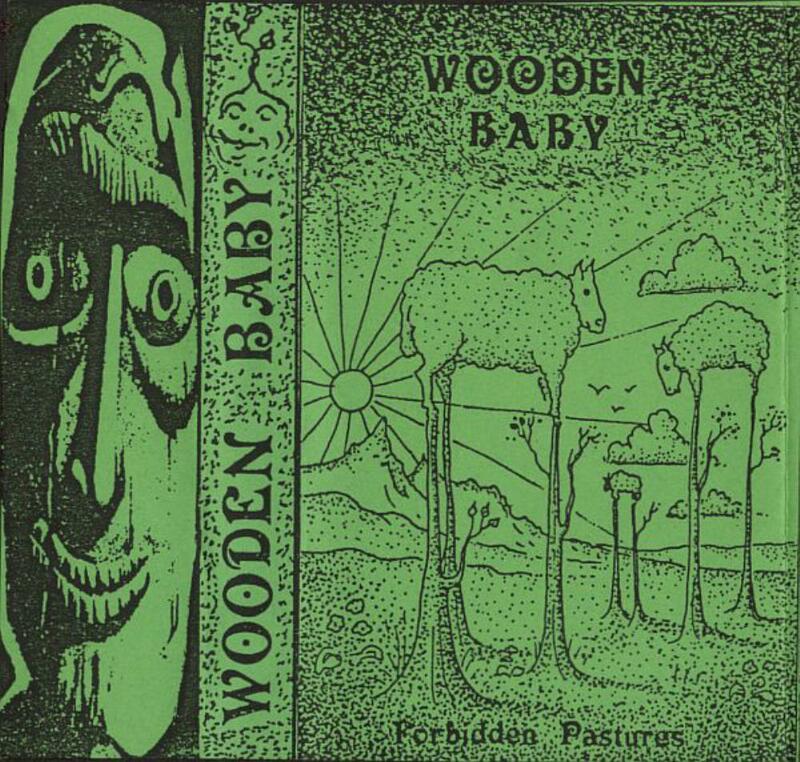 "Forbidden Pastures" may be less original, strange, impacting and personal than WOODEN BABY's two other releases. Furthermore, it contains some lengthy moments. Nonetheless, the duo manages to keep its own identity and weirdness though their compositions, which seem to come from another dimension. These pastures are not forbidden, the inspiration and psychedelic trip, as well as exciting tracks, are still well present. Recommended to fans of OZRIC TENTACLES, 80's HAWKWIND and space rock!